I had a “pinch me, I must be dreaming” moment last week when I discovered that another one of EDCCollective’s items was featured on Etsy’s front page. Last Friday, my vintage cloisonné butterfly belt was picked by Etsy for a front page treasury that was posted at 12:30pm EST. You can click on the treasury to enlarge it. And even better than the increase in views and hearts that I received from the exposure on the front page, is the sale that resulted! Thanks Etsy. I found out from my customer that she had had a similar belt many years ago that she loved and jumped at the chance to purchase mine when she spied it on the front page. Sometimes when people go to Etsy, they know exactly what they are looking for and sometimes things like Etsy’s front page treasuries will let them discover things that they didn’t know could be searched for. I think it is really cool that Etsy brought this customer and my item together like that. What do you do with material from broken or outdated jewelry? You can recycle, repurpose and upcycle it into “new” fashionable jewelry that fits your current needs. This is exactly the charge that I was given by a recent customer. 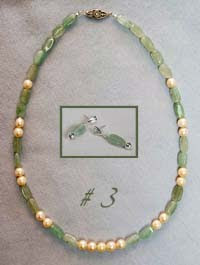 My customer had some loose pearls from her mother’s necklace and an outdated double strand jade necklace. (See inset customer's photo in photo #1.) My instructions were to design a fashionable necklace for her daughter from these materials and any others that I thought would give the necklace a more contemporary look. The only other must have was to use 19 of the pearls in the design. 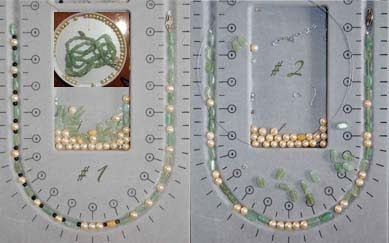 As I laid out the necklace, I took care to match the color and shape of the jade beads that would be across from each other. At first glance, they may look alike, but they varied by how the holes were drilled, their shape and length and color just enough that attention to these details would make a difference in the look of the finished necklace. So don’t rashly throw out that broken bracelet or dated necklace. Think about your current likes and see if they can become a new piece of recycled, repurposed and upcycled jewelry that you can cherish for years to come. 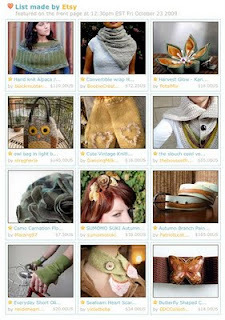 What’s even more exciting than being chosen by your peers to be in a treasury on Etsy? That’s being picked to be in a treasury by Etsy for the front page. 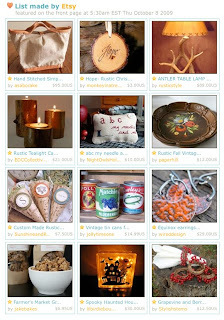 EDCCollective was honored to have its Rustic Tealight Candle Holders included in a treasury featured on Etsy’s front page at 5:30am EST on Thursday, October 8, 2009. Below is a screen shot of that treasury. You can click on the photo to enlarge it. Whether by getting to know fellow Etsy team members, browsing through Etsy or hearting your favorites, one is bound to get to know at least some of the artisans’ unique styles. If you have done this, you may one day stumble across one of your recognized artisans in a brick and mortar establishment like I did recently. My husband and I were invited to a large gathering of friends for lunch in Spring, Texas outside of Houston. Since we live in the DFW metroplex, this meant dedicating most of a Saturday to this sojourn. The organizer of our lunch didn’t realize that that particular Saturday was one of the busiest weekends for Old Town “downtown” Spring. It turns out it was their annual classic car show. The place was packed. We were lucky to find parking since the street that Google maps directed us to take was blocked and we didn’t know our way around. We did enjoy looking at the classic cars on our way to meet our friends for lunch and noted that there were many interesting specialty shops in this area. After lunch some of us did a little shopping and looked at more of the cars. My husband and I turned out to be the only ones parked on the other side of this quaint shopping district, so after the others headed to their cars, we continued to browse some shops on the way to our car. When we stepped into Mason's Art Gallery, the proprietor invited us to look around and let us know that her shop contained items from a wide variety of Texas artisans. As we wandered toward the back of the gallery, I noticed some prints that looked very familiar. Upon closer inspection, I realized they were the work of fellow Etsian, EverythingDear. 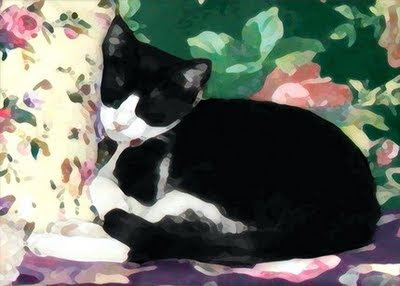 This is a seller that is a member of one of the teams I belong to, TexasEtsyCrafters, and a seller that I have hearted. I told my husband that if we ever need a gift for a friend that is really into cats, we need to buy from this seller. Her work is every bit as good in person as it looks online. There have been some wonderful autumn and Halloween themed treasuries recently on Etsy. I would like to share some that my items have been included in. Click on the images to see enlarged views. My Autumn Glass Earrings were featured in "Bourbon on the Rocks". Treasury curators seen to really love my Autumn Beauty Feather Pendant. 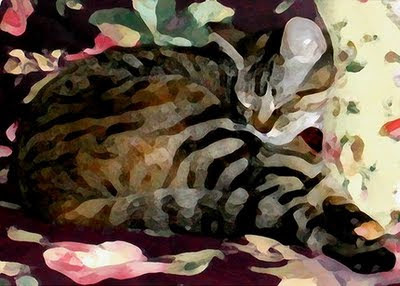 It has been featured in three treasuries; "Persimmons and Plums", "autumn orange from EART!" and "There's no such thing". Will you be the customer that loves it as much as the curators and add this lovely accessory to your collection?